"Another Clint Eastwood Oscar Winner. I'll watch it... as long as I don't have to watch 'Jeff Spicoli' cry again." Even being an avowed Clint Eastwood fan, I was wary of this movie. It stems from my feelings about Clint's previous "critically acclaimed" directorial effort, "Mystic River". I can't lie... I couldn't stand that movie. Aside from what I felt were terrible performances across the board (with special note of Sean Penn and Laura Linney's on-screen coupling, the worst movie-reality husband and wife I've ever seen), I felt that Eastwood's presentation of the movie was awful as well. Odd cinematography, out-of-place music, over-acting by every member of the cast; I left the theater bewildered by the accolades this movie was garnering. But I was obviously in the minority when it came to Mystic River. Oscar nominations out the ying-yang (including best picture). Everyone liked it but me. 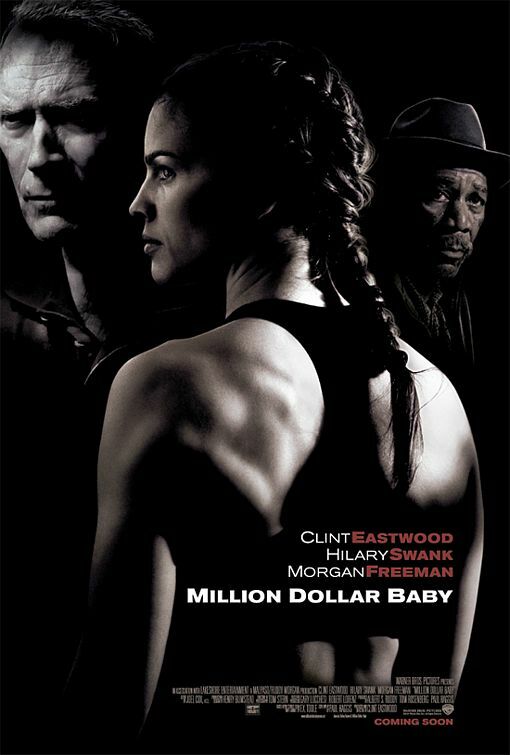 So when the hype started building for "Million Dollar Baby", I was really worried. I've enjoyed some of Clint's other director/starring projects ("Unforgiven" was fantastic, as was "The Outlaw Josey Wales"), but Mystic River really left a bad taste in my mouth. So I waited. The buzz continued. The Oscar nods were once again forthcoming. But I continued to sit this one out. All throughout it's theatrical run, even with close, personal friends giving me their heartfelt recommendations, I kept my distance. What can I say; a Sean Penn crying scene can really change a man. Finally it came out on DVD, and at my fiancé’s urging, I picked it up. After all, I am running a boxing movie review website. It would be a bit silly if I just ignored one of the most critically acclaimed boxing movies of the last 10 years. So I plopped myself down in front of the tube and tried to give "Million Dollar Baby" my most objective attention. Eastwood plays Frankie Dunn, a boxing gym owner and trainer/cut-man that might be too conscientious for his own good. After losing touch with his daughter as well as his God (his daily trips to church and antagonistic interactions with the spiritually exhausted priest were truly hilarious), he's become very protective of the one thing he has left, his fighters. But when his best fighter becomes tired of being handled with kid gloves and goes to another fight manager to get his title shot, Frankie is deeply hurt. His closest confidant, Eddie 'Scrap-Iron' Dupris (Freeman), tries to help Frankie out, but Dunn feels like he may be, in fact, done. Until Maggie Fitzgerald (Swank) comes to the gym. Eddie can immediately see the tremendous heart and ability that Maggie possesses, but Frankie isn't sold on her. His refusals are based in sexism ("I don't train girls! "), but underneath it all is Frankie's reluctance to get involved with another fighter when the possibility of being left is still hanging over his head. He feels too old and spread too thin to be left cold again. But Maggie's talent and unrelenting enthusiasm soon change Frankie's mind, and he becomes her trainer. IF YOU HAVEN'T SEEN THIS MOVIE YET, STOP READING! OK.. that's better. I feel I've done my part. If you're still reading, you've either seen the movie, or don't mind having them ruined for you in advance. I, personally, HATE having movies ruined for me. I find it an abomination; a sin on par with adultery or murder. So, by that standard, I would have to assume that the lady that was in front of me in the cafeteria line at my work that blathered out, "I couldn't believe the Maggie character ended up paralyzed. It was so out of leftfield!" will be burning in hell when her time comes. WHAT THE HELL, LADY?! MAYBE NOT EVERYONE THAT'S WAITING TO PAY FOR THEIR TURKEY SANDWICH HAS SEEN THE MOVIE! YOU EVIL SUCCUBUS! MOVIE-RUINER! AAAARRRRRRRRRGGGGGHHHHH!! It was a bummer, no two ways about it. But I must continue on! Even knowing that the movie was going to end on a down note, I was still shocked by the suddenness of it. Up to the point of Maggie's paralysis, the movie was moving forward at such a happy pace. The relationships between Frankie and Maggie and Eddie were a pleasure to watch, and the humor was perfectly light. But the completely arbitrary turn of events during Maggie's championship fight with Billie "The Blue Bear" (played by Shadow Boxers star Lucia Rijker) was too jarring for me. It was too much of a departure from the upbeat tone of the film, and from that moment on, the movie lost me. The unbelievably sad downward spiral from this horrific turn of events was just too much for me too bare. I'm torn on "The Fightin'!" front as well. While Swank and Eastwood play the pupil and trainer parts to perfection, there were other elements that came up short. The fight footage was too staged for me, and a little too animated for my taste. While I know Maggie is supposed to be a special talent, the crispness and accuracy of her attacks and subsequent victories was a little too "on", for lack of a better word. Especially when compared to her somewhat lackluster (but believably portrayed) training sessions. Swank got herself into fantastic condition though, and even looked like she could hold her own when she was in the ring with the absolute specimen that is Lucia Rijker. And the fight trauma was gruesomely real. But the biggest kudos have to go to Morgan Freeman. His portrayal of former fighter Eddie 'Scrap-Iron' Dupris was so spot-on, it was amazing. His work as narrator alone brings movies to another level, in my opinion. But his heartfelt and heart-wrenching turn as a guy who had his shot and missed it and can't bear to see someone else do the same was above and beyond what usually passes for the "sage, old gym rat" role. He elevated the movie. Don't get me wrong; I enjoy a good tearjerker. I've got a REAL soft-spot for certain movies (just pop in "She's Having A Baby" and cue up Kevin Bacon's hospital waiting room scene, with Kate Bush's "This Woman's Work" playing over the 'good times' montage while he cries... I'm getting all weepy just thinking about... sniff... give me a moment here.....). My wimpy-ness aside, I couldn't stomach the depressing turn of events that played out. Literally. It made me feel ill. I (unfortunately) can't imagine what it must have been like for people who had no knowledge of how the plot would turn out. I would think it must have been a VERY emotional experience. But for me, it was too much to take in. Too much of a build-up and then an emotional letdown. That being said, the efforts of Swank, Eastwood, and, especially, Freeman should be recognized. Their performances were something to savor. It was almost enough to wash away the memories of "Mystic River". I'll take a Clint crying-scene over a Sean Penn weeper 10 times out of 10. But that's just me.